I have been an Ethan Allen fan all my life…still am.. 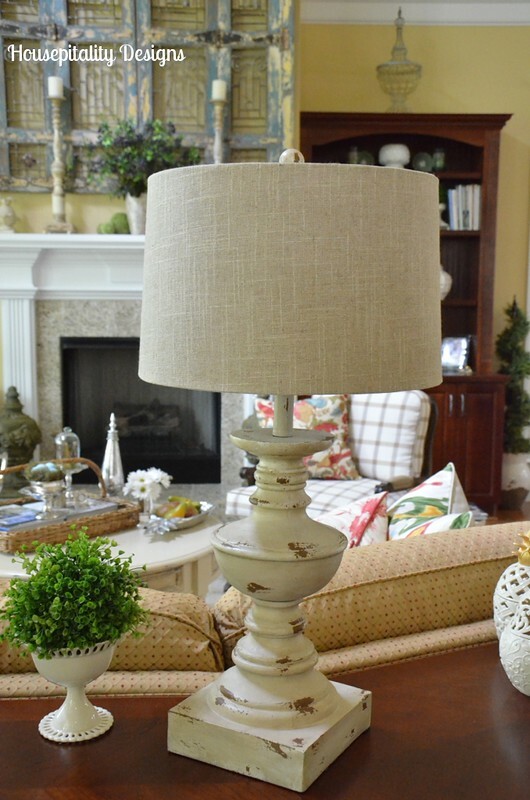 I wanted new lamps for the living room…I have had my eye on these wonderful lamps at Ethan Allen. They were on sale…however, even on sale, they would have been over $700 for the pair.. So I left the store…..Leaving those beauties behind. Looking sad 🙁 I asked my hubby if he would not mind driving me by the new HomeGoods..
…..that was just around the corner. Que the choir of Angels…!!! …..and the colors in my chair. 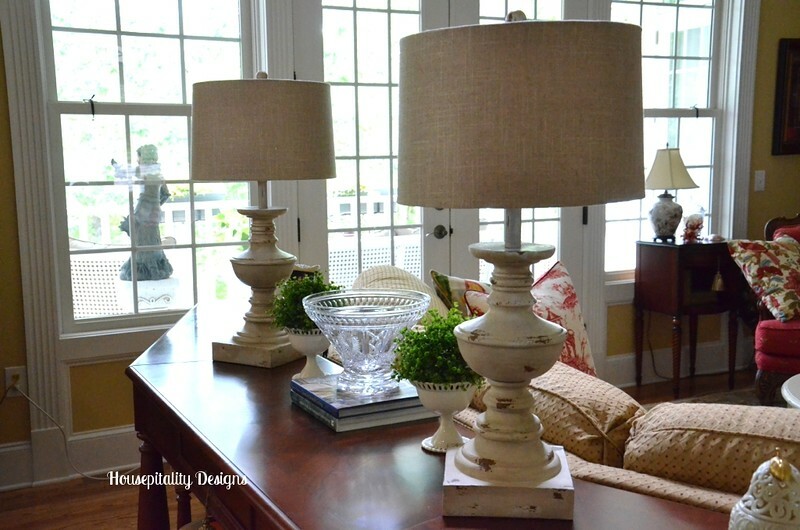 Lamps by Raymond Waites….Happy Dance by HomeGoods. …..and as I was wheeling the cart around..many asked, “are there more of those”??? Hope you have a great week of finding wonderful deals and treasures! What a great purchase, Shirley–they go so well with your vibe! Love the new lamps and proud of your thriftiness. I was in Marshall’s yesterday (lamp shopping) and low and behold, they had not one, not two, but three of the lamps I previously searched the entire state for my great room. Oh, well, I like my second choice that I found at JCP.com. Have I mentioned that lamps seem to be a decorator’s nemesis?! I love your new lamps, Shirley! They’re perfect! I also love Ethan Allen, but I know they can be expensive. Great addition to your living room! Oh Shirley, I can hear those angels singing just by looking at your pics! I too love HomeGoods and just picked up a lamp myself. I was drooling over most of them and will be going back soon. Thanks for sharing your finds! You did good! I love it when that happens! :-) Beautiful lamps, Shirley! Shirley, those lamps are gorgeous! I bet your husband had a big smile on his face when you saved all that money! You are so lucky to have so many HomeGoods near you. The closest one to me is about 45 minutes away and I’m feeling the urge to get there soon! Great find, Shirley! Love the lamps. They are perfect for your decor. I can just see you doing the happy dance!! What a great deal and they look wonderful in your room! Barbara’s recent post…New Paint Products In Stock! Shirley, I certainly think you made a wise choice. Wow 700 was just to much for 2 lamps. What a score you made and they are perfect for your space. You did good, girl!! Shirley, I was just a HomeGoods yesterday and didn’t see those. Darn they are wonderful! They are perfect. Que the angels! I love HG, they seem to always come through!!! I haven’t been there in so long. Trying to hold out until the house is done. Nothing will be happening on that front until after Labor Day, sigh. I look at as a good thing because when we are done and I need things HG will still be there and it will be so exciting. LOVE those lamps, by the way. Sorry I got off track for a moment. Home Goods is probably my #1 store. I stop in there about twice a week. It is hard not to buy things I really don’t need, especially small accessories. They have a wonderful lamp department. I love the lamps you found, I also like lamps that have a base that appears to be concrete. Great Finds!! Shirley I was looking at the exact same lamps in our HomeGoods. I love them…they’re perfect for your living room! and the atmosphere you create for your family! You did good! I love deals like that…..and I love Home Goods, too. Wow, they could not be any more perfect. They are beautiful. It surely pays to walk away from the “too expensive”, because just around the corner is something more reasonable. It takes lots of self control to walk away from something you really, really want. I guess you’ve learned that there’s always something that was worth waiting for. 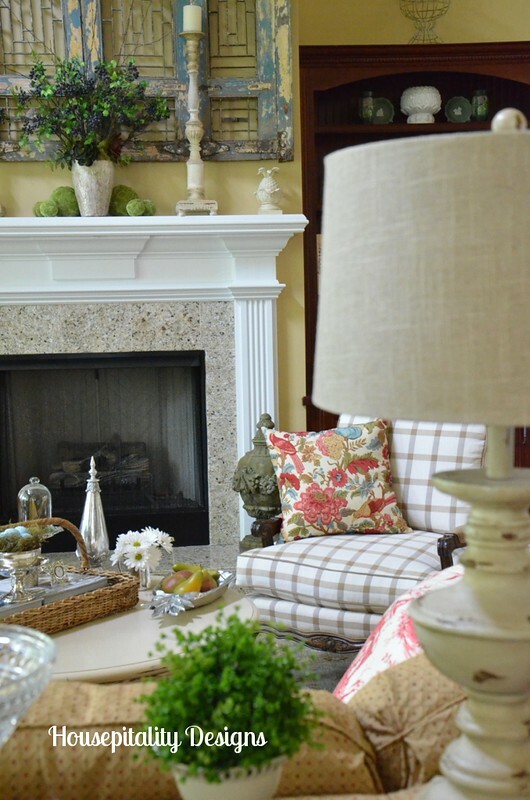 The lamps match perfectly with all of your accessories in your living room, just perfect! Good job. homegoods is amazing!!!! 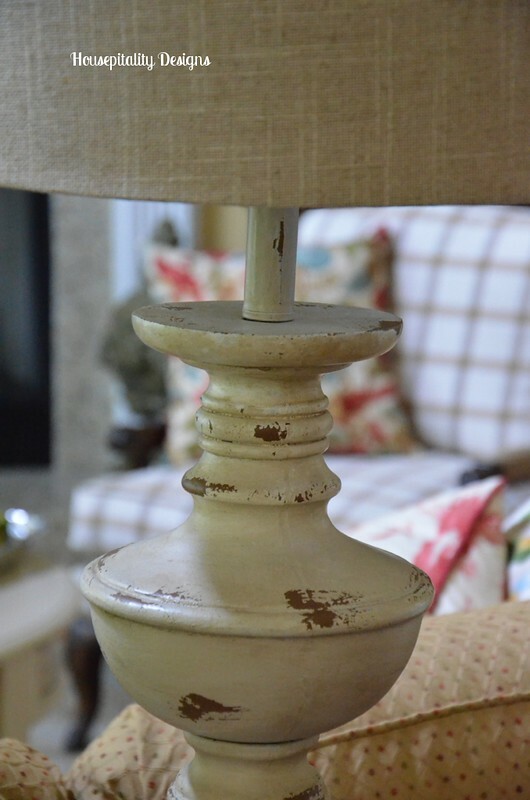 the lamps look perfect in your home, and what a steal they were! I’m a lampaholic, so I’m really enjoying your finds lately Shirley. For me, a life without HomeGoods is a life hardly worth living ;). I just noticed we both have lamp posts in our headers! Please excuse the lower case. Seems my iPad has decided to act up. Oh, your lamps are just wonderful. But, no fair! 5 Home Goods in your area – there is 1 40 minutes away. I love HG, but don’t get there often. 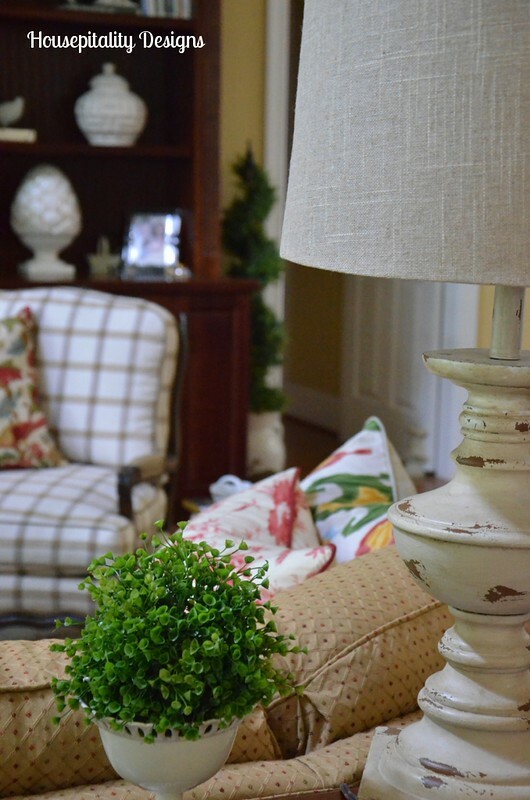 I have lots of things from Ethan Allen – in fact a pair of lamps I bought for my bedroom after I got married … before I discovered DIY and blogging! Love your pair – they light up my life! I can just see you smugly walking around the store. Fun, wasn’t it? Love the lamps and yes, they are perfect. What a deal, Shirley! I just love your lamps. And you know that I love HG’s. 😀 The lamps fit perfectly into your family room. I like the way that the bit of distressed look ties in with the distressed shutters over your fireplace. Love your new lamps!!!! You go girl! You always have the best taste!